Cy Reed is back in KNOX! Cy Reed is back, better than ever! 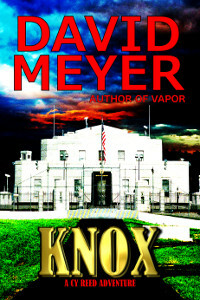 KNOX, the fifth book in the Cy Reed Adventures, takes our favorite treasure hunter deep into the most forbidden vault on Earth … the U.S. Bullion Depository at Fort Knox. But the depository holds more than just gold bars. 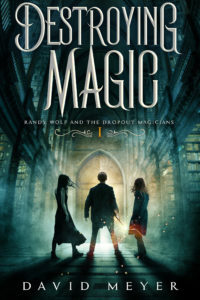 It contains plenty of explosive secrets as well … secrets that just might bring the world to its knees. I grew a lot while writing KNOX, both as a writer and as a person. As such, I think you'll find it's my most thrilling book to date. Now, let's check out KNOX! My fingers closed around a heavy knob. But it wouldn’t twist. I pounded my fist against the door. It felt like steel. Come on, Malware … open up! Glancing over my shoulder, I saw an officer take charge of the water cannon. Other officers hustled toward me, batons and riot shields clenched tight in their gloved hands. To the side, I noticed the masked men shake their heads free of cobwebs. Meanwhile, Saul rose to his feet and spun toward me. Metal clicked. The knob twisted in my hand. Swiftly, I wrenched the door open, exposing a black void. I hustled into it and shut the door. Metal clicked again and all sounds—the screams, the sirens, everything—vanished. I grabbed my satphone, and flicked the screen just in time to see the time change to 9:20 p.m. I exhaled a soft breath. Then the phone dinged and a message appeared on the screen. A deal’s a deal. She lives … for now. KNOX is now … FURY! Cy Reed Unearths the Infinity! Posted in Cy Reed, David Meyer and tagged Cy Reed, Cy Reed Universe, David Meyer, Fiction, Knox. ← Are you ready for BEHEMOTH? !